Pierre Jules Mene was one of the leading Animalier sculptors of the 19th century, rivaling Antoine Louis Barye in his output of sculpture. Mene was best known for this domestic animals, dogs, horses, cattle, sheep, chickens, and these consist of the bulk of his work. His attention to detail and to realism is unparalleled. Mene also ran his own foundry, or atelier, and thus had strict control of the casting of his bronzes. His son in law Auguste Cain was the head of the foundry, he was also a fine sculptor and the bronzes produced by them are of superb quality in both technique and patina. This model of a Nanny Goat with Her Kid shows all of Mene’s talent in creating a portrait of two animals, a mother and her young one. The Nanny Goat is standing up on a stump with one front leg raised and looking down at her little Kid. The young Goat looks up at her and one would almost expect them to break into a playful frolic together. A charming model, the Nanny Goat and Her Kid was popular and was cast by Mene during his lifetime, and these Mene atelier casts are rare. After his death it was cast by Barbedienne who purchased the rights to the model. This sculpture was also cast in iron by the Coalbrookdale foundry in England in the mid 19th century. 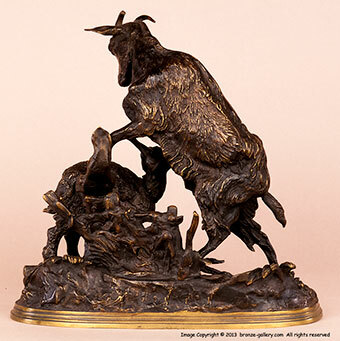 This fine bronze was cast by Mene’s own foundry in the 1850s, and it is a superb cast with sharp details in the features and fur of the Goats. It has a rich dark brown patina which shows the two Goats well. A lively group, it would be a nice addition to any collection or home. 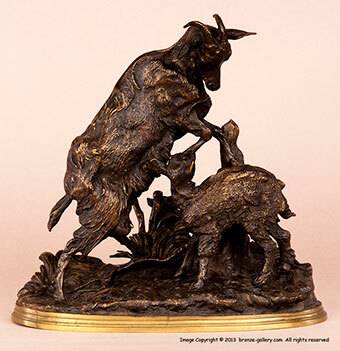 This model is illustrated in Payne's book Animals in Bronze on page 266.